I bought the car new in July, 2017. recently, noticed that after the car has been sitting for hours, the first turn on steering wheel will hear the clunking sound from the location around suspension section. it only happened once, will not appear if turning the steering while around trying to replicate the sound. will not happen second time until next circle that hours parking and make first turn on steeling wheel. there is TSB symptom saying about the spring protector or lower control arm bushing. is anyone having the similar issue? Look here. A few of us has had that problem. Hi, I see the last reply on that thread was from you. after change left and right lower control arm, as of now, do you hear anything from front when turning the steeling wheel after car siting hours? No sound at all! Smooth and quiet ride. I tested it out multiple times letting the car sit for 2 days and trying to get a sound out of them and got nothing. Just make sure that the dealership hears the noise. 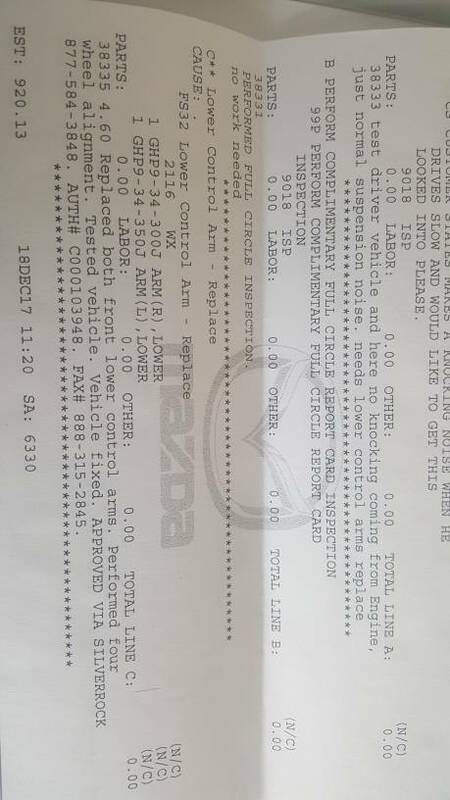 I basically wouldn't leave until they heard it and they quoted on the receipt that it was normal suspension noise.... but the lower control arms needed to be replaced. Hi thanks for quick reply. it is hard to let dealership believe the clunking noise is from lower control arm. do you know which TSB is related to this issue? Thanks for a lot on taking the screenshot. No problem. Yeah I saw some people with different solutions. I noticed that some people who heard the noise over bumps had the problem fixed by replacing the struts. People who would turn the wheel going slow, like out of a parking space, had the problem fixed by replacing the control arms.